The Museum of the Filipino People (Museo ng Lahing Pilipino) is a component museum of the National Museum of the Philippines occupying the Old Finance Building, located in the Agrifina Circle, Rizal Park, Ermita, Manila adjacent to the main National Museum building which houses the National Art Gallery. It is home to the anthropology, archaeology, and zoology divisions, the governing bodies officially tasked for labeling, maintenance, preservation, conservation, rehabilitation, and restoration of the anthropological and archeological patrimony of the Philippines made easily accessible to students and the general public. I went here on September 10, 2013 at 3:21 p.m. after visiting Rizal Park and before National Art Gallery, three weeks before the Museums and Galleries Month. The architecture of the Ifugao house (Fhaley ad Henenga), of which, there are many varieties based on the different Ifugao sub-groups, is reflective of the geography of the region. The heavily thatched roof serves as protection against the rains and cold weather of the region. This authentic house is the Ayangan heritage, a sub-group of the Ifugao people. Henengan was the ancient name of the municipality of Mayaoyao. A walk-in diorama depicting the wreck site of the Spanish ship San Diego, its artifacts and how it appeared when discovered by archeologists at a depth of 54 meters underwater. San Diego is a Spanish trading vessel built in Cebu by European builders. It was originally known as the San Antonio and was docked in the port of Cavite for reconditioning when Antonio de Morga, then Vice-Governor General of the Philippines, ordered it converted into a warship and renamed it San Diego. Traces the history of the battleship San Diego when it collided with the Dutch ship, Mauritius, on Dec. 14, 1600 off the shores of Nasugbu, Batangas bringing down 14 cannons, armaments, and navigational instruments. Showcases treasures retrieved from the ill-fated ship, San Diego, which include jars, porcelain, jewelry, tableware, devotional items, silver coins, and pottery. 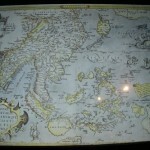 The gallery presents information on the origins of the Philippine Islands and the Filipinos as a whole. The exhibition focuses on the four periods of Philippine pre-history : Paleolithic; Neolithic; Metal; and Ceramic Age. Interactive displays and hands-on gadgets are installed to make the visit more meaningful and enjoyable. The Archaeological Treasures Gallery shows portrayals of burial practices of ancient Filipinos associated with the death of early Filipinos in different parts of the country and burial jars as well as samples of other utilitarian vessels unearthed from different cave sites in the Philippines. This ethnographic exhibit focuses on the Philippines as a land of diversity, crossroads, and a tapestry of cultures. The gallery showcases some regions that have been influenced by migration over the millennia, while others have developed in relative isolation, locked in by the roughness of the terrain and adapting to their distinct environment. These cultural influences, adaptations and response to the environment led to the emergence of major ethnolinguistic groups with many sub-groups. Having a common prehistory and background, all ethnic groups in the Philippines speak languages that belong to the Austronesian family. It is the variety with adaptive techniques and cultural diversity throughout the archipelago that make the Philippines unique. The exhibit is divided into 4 sections: The Filipino People, The Ecological Zones, The National Treasures, and The National Living Treasures. Featuring the writing system of ancient Filipinos, Baybayin exhibits archeological artifacts including among others, the Laguna Copper-Plate and Calatagan Pot, archival materials loaned from the University of Santo Tomas, National Historical Commission of the Philippines (NHCP), the National Library, and the National Archives. The continuing tradition of syllabic writing among the indigenous communities in Mindoro and Palawan, particularly the Hanunoo-Mangyan, Buhid-Mangyan, Tagbanua, and Pala’wan peoples through the ethnographic collection of the National Museum s also shown here. Amulets and talismans bearing baybayin scripts and Latin words used by Millenarian movements, particularly in the Tagalog region near Banahaw, also manifest the continuity of the script and the enduring practice of including words symbolized in old writing — conveying belief core, indigenous powers. The revival of interest use of baybayin as a disctinctive marker of Filipino identity among the youth both in the Philippines and abroad through websites, animations, blogs, tattoos, and t-shirts is also presented here. Resonance of the ancient and traditional with the contemporary transnational and cross-cultural recontextualization allows integration of multiple voices and interpretations. The Calatagan pot: height of 12 cm, width 20.2 cm, diameter 14.8 cm, weight 872 grams. Laguna Copper-Plate: 10th century, length 20cm, width 30cm. Hibla ng Lahing Filipino: The Artistry of Philippine Textiles features the National Textile Collection, the colorful and interesting Philippine traditional textiles from the collection of the National Museum and from the National Anthropological Collection and private collections such as those from Senator Loren Legarda, as well as archival photographs, some dated as early as 20th century. This collection includes selected rare textiles that depict exceptional craftsmanship of the Filipinos not commonly found in private collections. Among many fabrics and other objects, we are displaying usable weaving looms to give proof of the weavers’ genius in both their ability to keep mental templates of designs and their technical abilities to create cloth from fibers. On display are heritage textiles and clothing, samples of production materials and technology (like the piña foot loom and abaca backstrap loom), as well as historic photographs of Filipinos in traditional garb at the 1904 St. Louis Exposition (courtesy of the American Museum of National History archives) and modern images of indigenous Filipinos in their native wear from the collections of the National Museum and its partners.